Jamba Juice offers healthy fruit smoothies, all-natural baked goods, steel-cut oatmeal, sandwiches, and other healthy delicious bites. 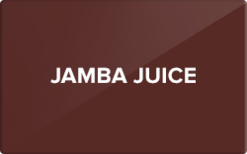 Discounted Jamba Juice gift cards can be used on top of sales and coupons. JambaJuice has BOGO offers often. Don't forget to sign up for Jamba Insider to get free smoothies or juice on your birthday and personalized rewards.